UX lessons from Amsterdam trams - Harold Tor. I was in Amsterdam earlier this week to visit the reopened Rijksmuseum. 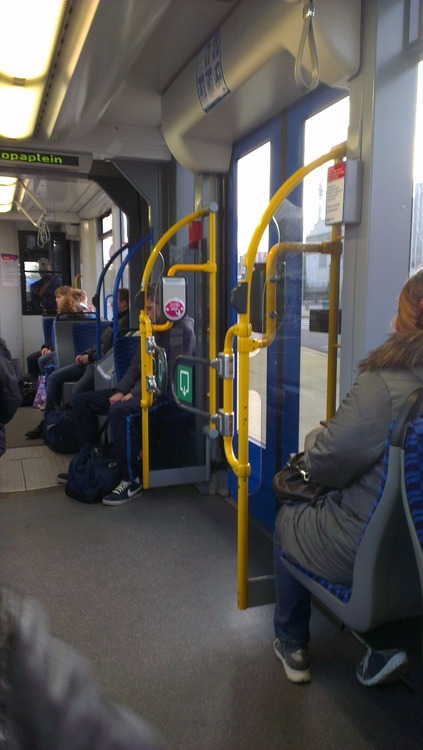 As I was taking the tram, I realised that user experience was taken into account in the design of the passenger flow. Something that is so transparent, yet useful, which is what UX is about. First of all, the transport company GVB wants people to board at specific doors, not those where passengers are alighting. There are only two points of entry on Amsterdam trams: one where the driver is (at the front of the tram), the other where the conductor is (near the rear of the tram). This system solves the situation where people are uncivilised and selfish, they cannot wait for other passengers to get out before they can rush in to get the seats. The clash of alighting and boarding passengers often leads to slower boarding and unloading, contrary to what people think. Hence, these metal bars which are attached to the sides of the door ensure when passengers get out, boarding passengers cannot slither in through the sides. On top of that, because of the installation of these bars, you do not have people standing or leaning on either sides of the doors, which narrows the space for getting out. The two points of entry is manned by the driver and the conductor: with the visual surveillance by the company officers, you have heightened security, people are less likely to cut queues or push (they would otherwise get told off) and payment is ensured. In Amsterdam, ticketing is electronic, as most modern public transport systems are (except in Flanders). This helps to ensure people do not stand at the entrance to wait for the archaic validation machine to punch a hole in their ticket and thus block the entrance for 20 seconds. This system requires checking in upon boarding, and checking out upon alighting. Placing the electronic sensor between the doors and the metal bars makes sure that people get ready to alight and start queueing up to do so, because the sensor is further away. If they forget to ‘check out’ they would lose money on their card, hence by using their fear of losing money, the company is able to make sure people exit in time AND in an orderly manner. The smooth user experience in the GVB trams is a lesson not only for public transport companies in other countries, but also a lesson for web and app developers. How do you help them achieve their goals in the easiest and most efficient manner? What are the tools you can use to do that – colours, fonts, pathways, psychology? Remember, your users do not mind paying more (like I do) for a smooth UX. Time, efforts, frustrations (imagine peak hour travels with rowdy students and tired office workers) are a higher price to pay.